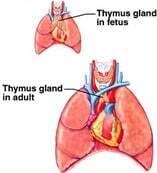 The thymus gland plays an important role in the development of the immune system development while a fetus. As people age, it becomes a fatty like tissue. The thymus has the potential to develop tumors (e.g. thymoma) that are best treated with surgical removal of the entire thymus. Myasthenia Gravis is a disorder that can be improved with removal of the thymus, even if a tumor is not present. There are various approaches to removal of the thymus. They include: thoracoscopy (VATS), robot-assisted, and with a sternal incision, similar to heart surgery. Determination of the approach used for removal of the thymus gland (thymectomy) is made by the operating surgeon after evaluation of the patient and radiologic studies. Recovery after thymectomy usually varies depending on the surgical approach utilized by the surgeon. Recovery and return to daily activities is usually shorter with the minimally invasive approaches.